My father, Ronald Green, had this photo of himself taken many years ago in England. 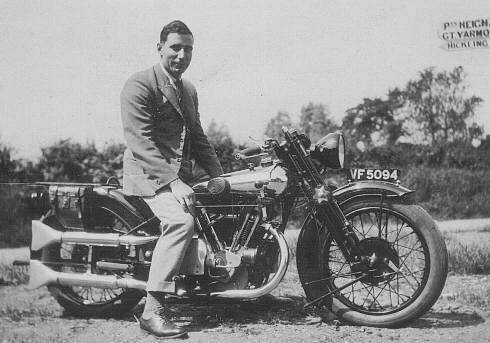 "Aboard a Brough-Superior about 8-10h.p. It's the 'hottest' thing I've known. Special racer with overhead-valves, large plated exhausts, electric equipment throughout, & two carburettors. Note big brake drums - it needs them! At 'fifty' it is just running nicely. I don't think anyone could attempt its top-speed on ordinary roads. This bike costs about 120 pounds in England. Everything has a wonderful finish. Note silver-plated petrol tank."